It’s probably unfashionable to love Doctor Zhivago but there’s no need to deny one’s passions. David Lean’s superlative epic wasn’t the first sprawling love story set against the grandeur of history and war, but along with Gone With the Wind, Doctor Zhivago arguably is what every filmmaker hopes to achieve for their own period romances. From Titanic, Australia, Pearl Harbor and on and on, Doctor Zhivago is the benchmark these films are trying to measure up to. David Lean had spent most of his directorial career on more smaller studio productions, but with the success of Bridge on the River Kwai (1957) his cinematic canvas got larger and larger. 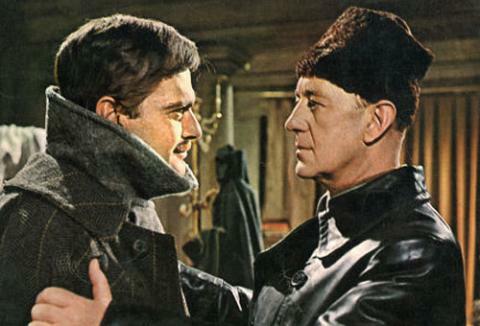 Next came Lawrence of Arabia (1962) and then Doctor Zhivago (1965). His 1970 epic Ryan Daughter was a failure, but for the previous three, it’s a remarkable trio of films. As per Boris Pasternak’s novel, Doctor Zhivago charts the illicit romance of a married doctor/poet, Yuri and a gorgeous but emotionally damaged temptress Lara. Lean begins at the end of the story with Zhivago’s Communist brother (Alec Guinness) who operates a giant water dam questioning a young girl about her mother, presumably Lara. Flashing back to before the Russian Revolution we see Lara (Christie) wrestle between a relationship with her Revolutionary boyfriend Pasha (Courtney) and an affair with father’s business partner Komarovsky (Steiger). After a suicide attempt, Doctor Yuri (Omar Sharif) tends to Lara thus, their first meeting. Yuri, himself, is married and with a child, and it isn’t until years later while a medic in WWI does he formally meet up with Lara who is a nurse on the front lines. Romance now strikes amid the horror of battle, a romance which blooms into the full blown affair which will emcompass the rest of the film. Pasternak and Lean both overcome the hurdle of having their main character generate sympathy despite being an adulterer and abandoning his family. It’s in these contradictions where Doctor Zhivago triumphs. The complexities of the Yuri’s inner pain rarely come out, instead the tumultuous and violent historical background is the expression of his feelings. In the middle act when Yuri is at his most unlikeable, a man so lustful of Lara, he can’t help but lie to his wife and leave his family alone in their rural home to visit and thus make love to his mistress. Lara, who also recognizes their wrongdoings, also comes off as sympathetic. Perhaps even more so with Zhivago than in Kwai or Lawrence, Lean manages to put as much attention on the details as the big picture scope. In fact, if anything the spectacle of history is put farther into the background than either of his other epics. Unlike the other two pictures, most of Zhivago is spent indoors, protected from the coldness of the Russian winter. Take for instance the interiors of the Moscow scenes. Lara’s apartment is dimly lit and claustrophobic even, and rarely does Lean go outside the confines of these locations. And when he does, Lean dramatically contrasts this intimacy with awe inspiring scenes, a sharp contrast which enhances the spectacle. The best example is Lean’s reveal of the worker’s revolt which engulfs the streets of Moscow on the night of the Lara’s dramatic breakdown – the emotional fury and anger of people who stand off against the army mirroring Lara’s internal trauma. Lean’s background as an editor serves him well, he constantly uses abrupt transitions to take us in an out of the flashbacks and compressing time in unorthodox ways. His compositions are masterful from his expansive wideshots to the detailed close-ups, his control of every detail is mindboggling. And Maurice Jarre’s elegant score – his ‘Lara’s Theme', then a legitimate pop music hit – becomes the blanket of tone and emotional feeling which ties everything together.